Paradox's internal development studio, well known for its historical strategy games Crusader Kings II and Europa Universalis, is heading into the future for the first time with Stellaris. You explore, wage war and conduct diplomacy in procedurally generated star systems populated by procedurally generated aliens. You can research technologies that might "completely shatter your concepts of civilization", and design your own battleships to shatter other species' concepts of civilization. Paradox' historical strategy games can be daunting for newcomers, but they are top-class story generators. Both games are broadly about empire management, but CK2 in particular brilliantly models your relationships with selfish and fickle AI heads of state. Decisions in Crusader Kings can create torrid family drama and political intrigue. If Stellaris can bring that soap opera quality to futuristic first contact scenarios, this could be amazing. You can find out more on the new Stellaris website, which features a picture of one of the handsome alien races you can meet. Why hello there. 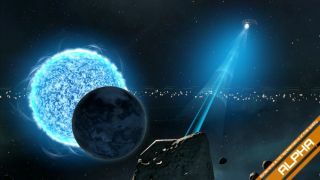 Here are some more screenshots, from the Stellaris Steam page.